Speaking in tongues is one of the spiritual gifts bestowed upon believers in Christ. Interpretation of tongues is another spiritual gift associated with it. And again, I exhort you, my brethren, that ye deny not the gifts of God, for they are many; and they come from the same God. And there are different ways that these gifts are administered; but it is the same God who worketh all in all; and they are given by the manifestations of the Spirit of God unto men, to profit them. And again, to another, the interpretation of languages and of divers kinds of tongues. And all these gifts come by the Spirit of Christ; and they come unto every man severally, according as he will. And I would exhort you, my beloved brethren, that ye remember that every good gift cometh of Christ (Moroni 10:8, 15-18). Let the gift of tongues be poured out upon thy people, even cloven tongues as of fire, and the interpretation thereof. In the church I had rather speak five words with my understanding, that by my voice I might teach others also, than ten thousand words in an unknown tongue (1 Corinthians 14:19). An example of speaking in tongues, but not through the power of God, was plainly manifest in February 2014, when the pastor of a snake-handling sect was killed after being bitten by a snake he was handling in a religious meeting. People at the meeting were supposedly feeling the Holy Ghost and were shouting and speaking in tongues at the meeting, which ended so badly. Pentecost is a perfect example of the proper use of this gift (Acts 2:1-18). The apostles of the Lord spoke in their own tongue, but they were understood by thousands of pilgrims in their own tongues. On that day, the power of the Holy Spirit was manifest and many were converted. 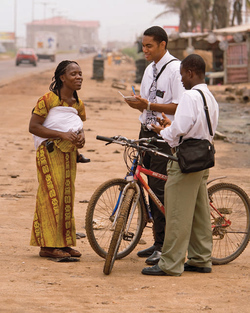 In The Church of Jesus Christ of Latter-day Saints the gift of tongues is manifested every day among the thousands of missionaries serving around the world. Missionaries learn foreign languages and the interpretation thereof with astonishing ease, and words come to them that they have not mastered. The gift of tongues has also been manifest in other, singular events, such as at the dedication of the Kirtland Temple. But speaking in tongues is not a part of normal church meetings, such as sacrament meeting or testimony meeting. ↑ Teachings of Joseph Smith, pp. 148-149, as quoted by Bruce R. McConkie, Mormon Doctrine, Second edition, p. 801. ↑ Teachings of Joseph Smith, p. 162, 212. This page was last edited on 18 February 2014, at 14:00.